Of the nine oil portraits of Sir Hans Sloane displayed on this website, the one I’m addressing likely is the least attractive, presenting its subject with a double chin, sagging cheeks and large, puffy bags beneath his eyes. Given my admiration for Sir Hans – what little I know of him, that is – why choose this one? 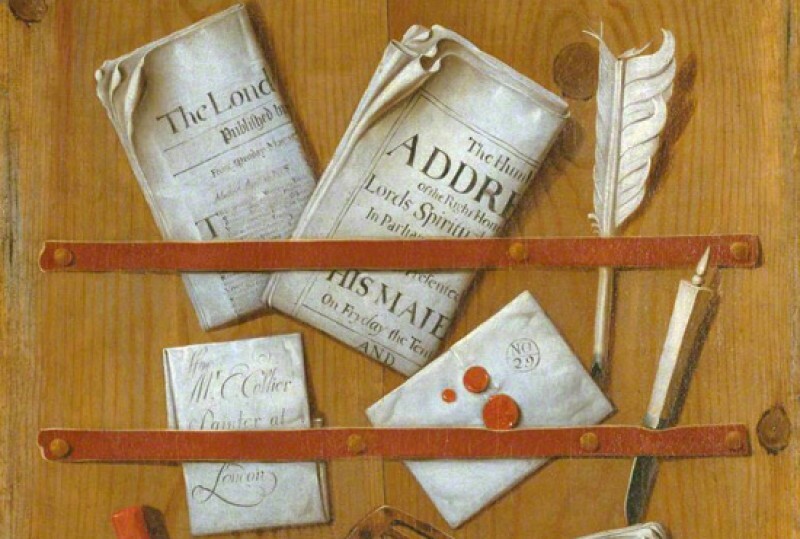 My article attempts to answer that question and connect the portrait to research I’m pursuing on A Curious Herb­­al by Elizabeth Blachrie Blackwell (c.1707–1758). I also list reasons why Sir Hans deserves wider recognition than he already receives for his generosity, foresight and achievements. The picture, itself, is a conventional eighteenth-century portrait of a British gentleman, aged 76 years. Sirs Hans’s seated figure creates a firm triangular base for his visage, and anchors carefully arranged tokens of his station in life. His high-riding, full-bottom wig; velvet jacket and voluminously cut shirt; figure-woven cravat and gleaming pendant all reflect his status as a baronet. His presidency of the Royal Society for Improving Natural Knowledge (nowadays known as the Royal Society) is indicated by the crested chair he sits in and the massive, golden presidential mace that rests on a cushion at the picture’s right. A niche in the background contains an effigy of Diana of Ephesus – her numerous breasts symbolising the fertility of Nature, to whom members of the Royal Society devoted their studies. But what draws our gaze are Sir Hans’s eyes – two beady, dark dots set in that pale, fleshy oval. They seem to demand our attention, even though they quickly shift it to the sheet of paper Sir Hans holds in his left hand and gestures towards with his right. That piece of paper and his reference to it are why I’ve chosen this rather unprepossessing portrait over others that might be more flattering. Partially unrolled, the sheet depicts a specimen of Lagetta lagetto, so-called 'lace bark', as drawn by Everhardus Kickius. The plant was plentiful in its native Jamaica, when Sir Hans collected a sample of it during his career-making sojourn to the British Caribbean in 1687. As a physician, his official mission to Jamaica was to attend the Duke of Albemarle. But as a passionate botanist and naturalist, Sir Hans spent much of his 15 months in the West Indies, exploring and documenting the islands’ flora and fauna, and acquiring hundreds of botanical specimens. He eventually published his findings in A Voyage to the Islands Madera, Barbadoes, Nieves, St Christopher’s, and Jamaica; with the Natural History of the Herbs and Trees, Four-footed Beasts, Fishes, Birds, Insects, Reptiles &c. Of the last of those islands. His text was accompanied by this and other images by Kickius, while his original specimen of Lagetta lagetto is preserved in the Natural History Museum’s Sloane Herbarium. Clearly, then, Sir Hans wanted to be represented as more than a Royal Society peer of Sir Isaac Newton and Sir Christopher Wren. He wanted to be portrayed as a botanist. Even as a youth in the Scots-Irish community in County Down, Ulster, his great love was of plant life. When young Hans moved to London in 1679 to begin medical studies, he conducted much or most of his research at the Apothecaries’ Garden in Chelsea – now known as the Chelsea Physic Garden – a place that came to owe its very existence to his patronage. It’s not entirely clear how Elizabeth Blachrie Blackwell was introduced to the garden, but it became her greatest resource in the massive project she undertook. Respectably raised in Aberdeen, Elizabeth Blachrie married a rather reckless second cousin named Alexander Blackwell and moved with him to London. All to quickly, Alexander fell into debt and was sent to prison. Elizabeth’s tireless work to pay his debt and free him is the context for production of A Curious Herbal and her acquaintance with Sir Hans. It also is fodder for numerous narratives, both online and print, about the devoted wife and pioneering woman author. Details vary with each source. The idea for an herbal focused on plants from the New World might have originated with the Blackwells. Perhaps Elizabeth was inspired by the work of Maria Sibylla Merian. Or the idea might have come from Sir Hans; he, more than many, would have known the need for a practical guide to New World plants. Again, the narratives vary. A letter in the Sloane Manuscripts at the British Library, addressed to Sir Hans by his colleague Dr Alexander Stuart, solicits Sir Hans’s support for a new herbal. Dated 12th August, 1735, it refers to 'an ingenious person' named Mrs Blackwell, who has made drawings of plants in the dispensary established by the College of Physicians and Surgeons. Isaac Rand, curator of the Apothecaries’ Garden, already had indicated his support and written a letter of recommendation in hopes that Sir Hans would sign. In any case, Elizabeth obtained endorsements from Sir Hans as well as the prominent physician Richard Mead. Using either a grant from Dr Mead or proceeds from sales of the herbal, Elizabeth bought Alexander’s freedom. Published in installments between 1737 and 1739, A Curious Herbal was lauded by the College of Physicians and Surgeons. A German edition of it was published by Dr C. J. Trew of Nurnberg. The Blackwells’ story eventually ended with Alexander traveling to Sweden where he was accused of treason and executed. Elizabeth lived out her days in Chelsea and, like Sir Hans, was buried in the yard of the Old Church, Chelsea.